Talking Heads, Islands, JAMC, The Rolling Stones – just four of the artists used by CNET’s Ty Pendlebury and Steve Guttenberg in their review of ELAC’s Uni-Fi UB5 standmount – quite possibly the most talked about loudspeaker of 2016. “The ELAC Uni-Fi UB5 loudspeakers offer the best performance of any speaker we’ve seen for the money,” enthused the CNET duo. No doubt the speaker’s relative affordability helps with the media buzz (cynics read: hype) – US$499 – but the man behind the UB5’s genesis probably helps more. The designer Andrew Jones, formerly of Pioneer, is every manufacturer’s dream ticket. He’s the kind of engineer you want fronting your brand, not the type seen elsewhere whom you’d wish would just stay in their R&D basement. Andrew Jones is affable, enthusiastic and charismatic in equal measure. If ever there were a school that taught loudspeaker design, you’d want Jones as the teacher. Back to the Uni-Fi UB5. We caught our first demo at its CES 2016 debut; here was what Jones could do with a slight loosening of the purse strings. Remember: the forerunning Debut B5, Jones’ first standmount for ELAC, kicked the door down at Newport Beach in 2015 and sells for a double-taking US$229. For slightly more than twice the dollars we get: concentric 1″ silk dome tweeter and 4″ aluminium cone augmented by a 5″ aluminium cone; braced MDF cabinet; vinyl wrap finish. Despite their overwhelming praise for these standmounts, Pendlebury and Guttenberg had two nits to pick, the vinyl wrap being the first – it had begun to peel away from one of the speaker’s corners. This could easily be the result of a well-travelled review pair but still. Europeans reading this shouldn’t be concerned at all. Apparently, vinyl wrap doesn’t play so well in the home audio market across the Atlantic. Instead, the Eurozone will see the UB5 in a painted finish at a slightly higher price (€TBC) to cover the uptick in production costs. And neither (apparently) do Europeans like a short and stout looking speaker: 8″ x 11″ x 13″. According to Jones, whom I spoke to at Munich High-End 2016 at length, they prefer a taller, more slender model. “Thin is in, in Europe,” says Jones. Consequently, the European version of the UB5 will be narrower and taller than its Stateside counterpart. 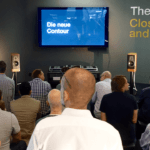 Note: according to Jones, any changes to the MDF used by ELAC Germany is highly unlikely to cause the new version to sound even slightly different to the original. What you will need – as per Pendlebury and Guttenberg’s second quibble – is an amplifier with high-current delivery, preferably one with plenty of watts on tap, lest you hit a wall with dynamics. Why? The UB5’s crossover network is so complex that it occupies the entire internal surface area of the speaker’s base. In chasing the desired frequency response, the midrange and tweeter have been shelved down to meet with the bass driver’s greater inefficiency – that’s just the way of passive loudspeaker design. The result is any amplifier connected to the UB5 will interact with the crossover network and not the driver/s; efficiency is rated by ELAC at 85dB. Perhaps why, at CES 2016, Jones used $4000-worth of Audio Alchemy electronics to ensure righteous impact with that deadmau5 cut. You know the one – it brings out the “Where’s the subwoofer?” Dad jokers. Similarly, Pendlebury and Guttenberg only found dynamic satisfaction during their listening sessions after moving from the 80wpc NAD C 356BEE to a 200wpc Rotel RA-1592. The message coming from the CNET review correlates with the designer’s own thoughts: that you might have to spend disproportionately more on any amplifier powering the UB5 should you opt for a pair. However, the possibility of having your cake AND eating it loomed larger than ever in Munich. You could take a passive pair of UB5 and choose to BYO electronics – such is the deeply entrenched audiophile way – or you could opt for the same speaker but in a powered version. ELAC will soon be introducing a fully active version complete with DAC and Roon-based Discovery server Endpoint capabilities. ELAC’s ‘target price’ for the active UB5 is reportedly US$750. That’s a whole lot less moulah than demanded by the Rotel or the Audio Alchemy. In other words, the incremental cost of going active won’t be anywhere like that seen by old school audiophiles who wanna fight for their right to party with whatever amplifier and DAC takes their fancy. The cost of choice they”ll likely never figure. As Jones explains in more detail in the video below, a Class D amplifier has been applied to the UB5’s 5″ bass driver whilst a less powerful Class A/B amplifier unit drives the 1″ tweeter and 4″ mid cone. The video is ten minutes long and yes, it’s an edited version. What started as a simple exposition on how Jones had activated his UB5 standmount soon morphed into a more philosophical discussion on the pros and cons of going active with your loudspeaker choice. Worth keeping in mind is that the active version, here at least, is closer to the sound which “the designer intended”. “I just want to go to my computer or server and play music – I don’t care about anything else”. That’s who the active Uni-Fi UB5 is aimed at. For the guy/gal who hasn’t been swallowed by their own gear lust. The guy/gal who is more into music that geeking out on spec sheets. Music like Talking Heads, Islands, JAMC and The Rolling Stones. Mark my words: the passive loudspeaker / amplifier box separation of the last four decades will eventually fall out of fashion (and for eminently good reasons). Active loudspeakers are the future of home audio, especially for those with a keen ear for pragmatism. One final thought: ELAC’s UniFi range will also come in floorstanding and centre channel versions. No word yet on their possible activation. Absolutely spot on! I think low end AB integrated and power amps will be the first to go. And the DAC/PRE/Phone/Streamer will emerge as a ‘control hub’. The fact that Jones is using a mixture of A/B and D amplification shows a pragmatism that trumps the marketing hype in so much hifi. Two anecdotes to further reinforce why this is the way forward. 1. I recently heard a tiny Bose (sorry) all in one speaker system fill a room with great music. Class D has come such a long way and can obviously be done very cheaply. Plus it runs cool and is small. 2. Speaking to a DIY amplifier manufacturer recently about the markups that occur in the luxury end of the sector. He sees what’s under the hood of these amps and is still amazed at their ‘how long is a piece of string’ attitude to pricing. The Job/Goldmund pricing structure is VERY telling – not that they aren’t great products. This is all fantastic, except for one thing. To my ears, every class A amp I’ve heard is divine. And there’s no way they’ll be in a speaker cabinet soon! Are there any active speakers that do a better job than the Kef X300a’s for a small room, particularly for way under $1,000 US? I have them sitting on my desk with Isoacoustic stands and have not one nit or complaint. Would love you to write a shootout review between ELAC’s new powered speakers in your review, the Kef’s or other appropriate contenders. Under a grand nothing beats those KEFs (that I’ve heard). I agree with your foresight regarding active being the future, and streaming as well. I don’t quite agree with putting the DAC into the cabinet just yet. At least have a DAC with a bypass allowing and external DAC.With digital technology changing at the current pace there is a high risk of obsolesce in a year or two. At the end of the day getting a sub $1,000, printed, active, three way pair of speakers that sound as good as those do is a game changer. Actually, I’m with your on keeping the DAC external. But that’s preference that may not align with such things as ‘market trends’. I am looking forward to hearing these at T.H.E Show. Yesterday I celebrated the fiftieth anniversary of two of my favorite albums, Blonde on Blonde and Pet Sounds hopefully they will be on the playlist. Alas, impossible to tell until a pair lands at my door. In terms of A/B comparisons, show reports are a long, long way from reviews. How do you think these would fare against professional monitors for nearfield/computer desk use? From what I and others have heard of the UB5’s low end reach, I doubt these would fare too well on the desktop. I was actually looking at the UB5 for my desktop. Would it help if I placed them on a pair of IsoAcoustics Apertas? Probably – but I can’t be 100% sure having never done it myself. Wow! Comparing the proportions, finish, and amplification of the $750 European model versus the $500 American model, I’d say that there is no comparison. European wins by a mile. Why not just offer the European model in active and passive versions? 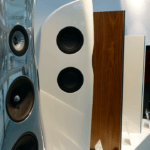 The white model in the photo reminds me of higher end efforts from KEF, Dynaudio, or even Revel to a lesser degree. I’ll bet another $100 for IsoAcoustics stands would pay off big to make up for a somewhat compromised cabinet. So, a $1000 hub, $750 powered speakers, $250 stands, and $100 for IsoAcoustics to go between the speaker and the stands and you’ve got a serious, minimalist rig for under $2500. Is there a more affable chap than Andrew Jones? I don’t think so. Vinyl wrap reeks of being cheap. At least it’s not woodgrain vinyl. That said they are more affordable than many other choices and it is said that speakers are what make the music. Economy of scale should allow these to be made with something far classier than melted down old floor tiles. Just kidding, but really now… It makes one think of vinyl fences and vinyl siding. Yuck! As for one reader’s apology for mentioning Bose, well, I own a pair of 30 year old 901s and while I have not gotten them set up in a few years I do recall the music they reproduced to sound excellent. Nothing to apologize for. Some people just like to dislike because others do so and joining in makes them one of the hip kids. It occurs. Again, speakers make the music (i.e., “sound”). Doubtless the speakers produced by ELAC will do just that. I may well look into them but I just bought a nice pair of Klipsch 2-way bookshelf speakers and a powered sub to go with a 40+ year old receiver. And then there are those 901s of mine…. They would require another classic receiver/integrated with tape monitor ability for the equalizer. One day. Nice read and the video was okay too! Thanks! Looking forward to seeing these in Newport. Was really impressed with the B5s last year but did not like the wrap, though I certainly understand it for that price. Nice to see there is a better option for Europe, might have to find a way to import a pair. Is there any info if the active UB5 will have analog input? Release date is probably to much to ask right now. A local store offers a demo pair of XEO 2 for little under a grand, but I need real analog input…Is there any way to bypass the XEO 2s DAC? John, do you think a Peachtree Nova 125se has the juice to run these properly? Thanks. I’d be confident of a yes. I appreciate your response. I was excited about these speakers when I first heard about them, but was discouraged when I saw their efficiency specs. They remain on my upgrade list. I also am looking to get the UB5’s to rest on either side of my iMac Desktop computer in order to do some music production work as well as for casual listening. I realize I will need to get small speaker stands to go with my rig and am looking for the best sonic fit. I am curious, as I am sure other audiophile/studio engineer types are, as to how you would rank various different speaker stands mating with the UB5’s. My potential candidates are Ardan Audio EVP-M1, IsoAcoustics Apertas, and the DiD from Daedalus Audio. I would also like your thoughts on BradleyP’s assertion that the $750 European version of said loudspeaker is better than the $500 American version. Cosmetics aside, I’m not sure how anyone could know with any degree of certainty how the two versions compare until they both land in the same room at the same time; an event that probably won’t happen to ANYONE in the world for a few months yet. Jones is always really interesting to hear speak. The reason I own ELAC speakers is due to hearing them at a show and being able to chat with Andrew. Most of my pals into music don’t think about their gear once it’s purchased and set up; they are too into music. ELAC gets this. Very good interview with Andrew J. from the point of view of the technical insights into Speakers Design. BTW I design my own speakers. Love to heard his speakers, UB5 if available at the forthcoming HIFI show, July 2016 in Melbourne. 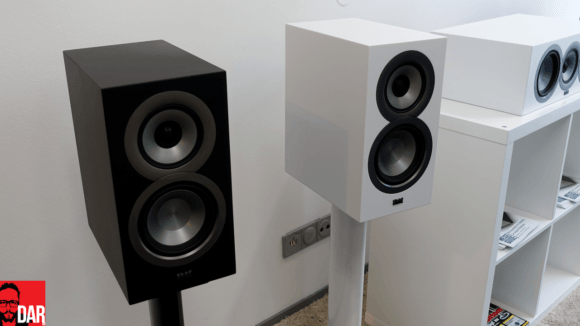 How does the passive version compare with kef ls50? Wonderful website John! Just found it, but I have already seen a couple of very interesting articles. Hey Mauro – welcome. Alas, we’ll have to wait until I get a pair at home in Sydney before A/B comparisons can be made. Very interesting article and video! I’m looking forward to seeing and hearing these speakers at THE Show in Newport later this week. Did Jones mention the active UB5’s at the THE show?